sew not difficult to do! I don’t DO sewing. I barely do washing. In fact when my children were recently taught a mother’s day song at school that went along the lines of ‘she does the washing, the cleaning and the shopping too..’ apart from being so cross at the implication and using it as an excuse to rant at my two sons about a hundred years of female emancipation, I needn’t have worried as they both spotted the error in the lyrics announcing ‘but you don’t do ANY of those things mummy.’ Exactly. I go to work. I work hard. I can afford to pay someone else to do that stuff. Or imagine this, I share this workload with my MALE partner (and does ordering Ocado on your ipad count?) Anyway, suffice to say I am a modern woman who is thrilled to be able to go online and order things. However, as having a house in France meant yet more opportunities to search the Rockket St George website for soft furnishings my husband grew increasingly frustrated with what he describes as an ‘almost compulsive cushion habit’. He’s right. I am to cushions what Hunter S Thompson is to illegal substances. Why stop at one when you could buy THEM ALL? And so, I decided I would see if I could make my own. I would stop spending insane amounts of money on bits of square fabric sewn around the edges and I would teach myself to sew. How hard could it be? I bought myself a sewing machine and sat down and read the instruction book. I learnt how to thread spools, do back stitch and forward stitch and not much more besides. And then I went on ebay and bought scraps of Cath Kidston fabric. If you could be bothered you could make a fortune selling old bits of rubbish that any normal sane person would throw out. There I was paying £3.50 for a 50cm square piece of spotty fabric. The kind of thing I would chuck in the bin if I had it left over from something. This is probably how Alan Sugar started and why I will never be a millionaire. I am the person buying up other people’s rubbish rather than seeing the money spinning potential in raggedy old bits of material. Truthfully, when you take into account postage and the time I spent fashioning these scraps into cushions I could have just gone to John Lewis and bought them for less. But, NOT THE POINT. I felt a massive sense of achievement when my cushion mountain was complete. 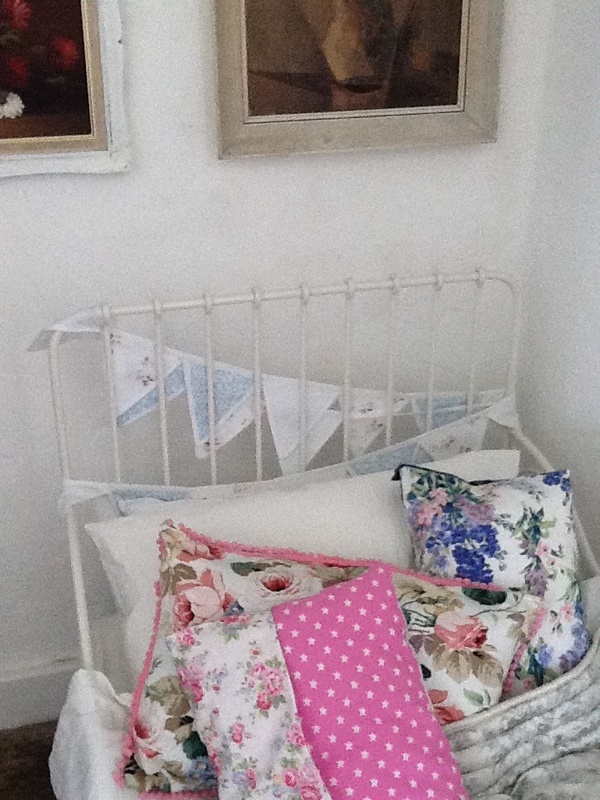 And then I cheated and bought some White Company bunting on ebay. But the fact was, my god daughter Cara was coming to stay and I wanted to make a room for her to sleep in that would get out all my ‘mother of sons’ frustrations. Boys do not appreciated hand made cushions. Or bunting. Or the lovely quilt I also got at the White Company. Oh or the lovely IKEA Minnen, white metal bed frame. But I hoped, that Cara would. And so I also went on ebay and sourced a wall of flower paintings. 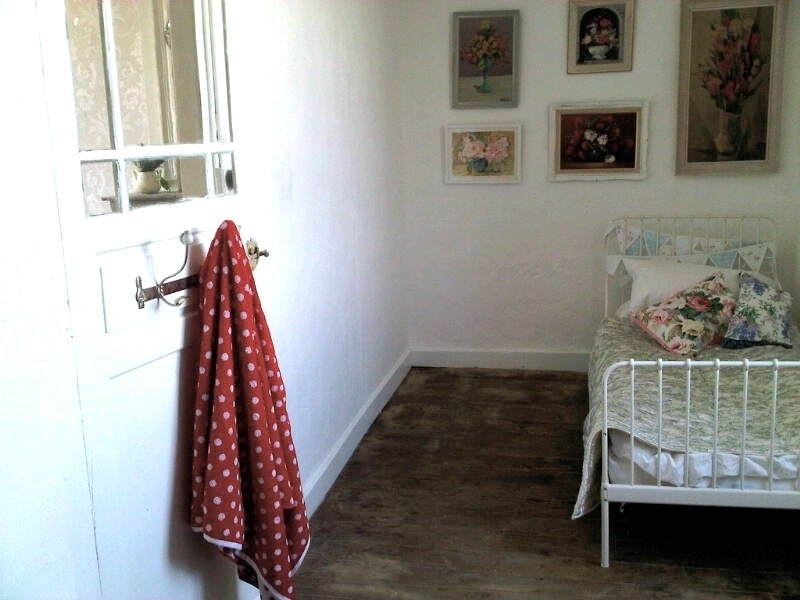 I bought up loads of cheap paintings that others were trying to get rid of and then painted the frames white and hung them in a group on the wall over her bed. And when she came to stay with her mum, my BFF, Petra, she LOVED it. And I cried with joy when I saw how much she loved it. My boys don’t get that kind of ‘really? all for me?’ look on their faces, other than maybe if I order them a dominoes stuffed crust meat feast pizza. But when Cara was shown the flowery room in France that was to be hers for four days, it made all the sewing and ebay sourcing worthwhile as her little face quite literally lit up. And I was bitten by the sewing bug. And taught myself how to make curtains! But that’s for another room on another day….. This entry was posted in Uncategorized and tagged cushion making, ebay sourcing, girls bedroom, ikea minnen, white company bunting by vicawhite. Bookmark the permalink.